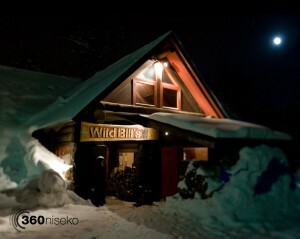 One of the largest and most lively bars in the Niseko area offers live music, free pool and an excellent restaurant. Located in the upper Hirafu village the bar is a classic alpine log building with a open log fire and has two bars. It has a warm atmosphere and serves excellently kept draft local beer and a good selection of cocktails. The restaurant upstairs serves a fresh Japanese Izakaya style menu ( Tapas ) perfect to share with family or friends. From 10pm the evenings really get started with DJ’s and live bands performing throughout the winter.